The exhilaration of forgoing traveling on asphalt alone in the brand-new Toyota Tacoma is merely the start. With room for five passengers, it clearly stands ready to take on anything from sloppy trails to your hardest endeavors. 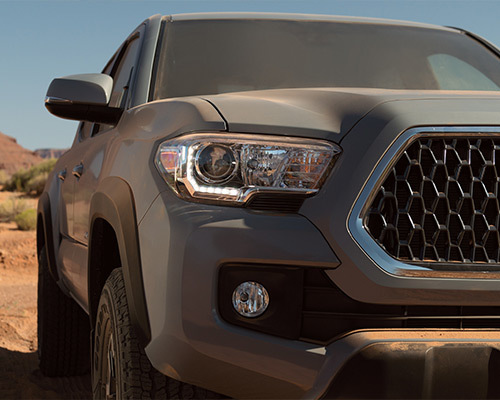 After taking a more in-depth look at how the Tacoma transforms routine days into grand journeys, odds are it is just a matter of time before you make your way to Westbury Toyota as soon as you are off the clock to purchase or lease a Tacoma of your own. Even when happily covered in dust and dirt, this exceedingly renowned pickup entices attention from every side. Its robust, sporting appearance showcases well-defined lines, muscular fenders, and a competitive grille. Tacoma’s easy-to-lower and lockable tailgate dons its iconic logo as the crowning style detail. 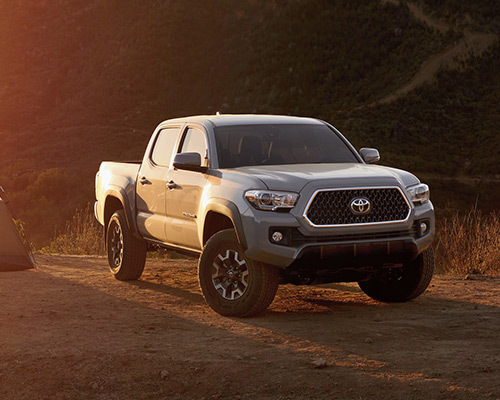 Obtain 159 horsepower (hp) and 180 pound-foot (lb.-ft.) of torque around the Westbury region with a 2.7-liter (L) 16-valve four-cylinder engine found within the Tacoma available to buy or lease at Westbury Toyota. If you demand even more power, the optional 3.5-L direct-injection Atkinson-cycle V6 motor furnishes 278 hp and 265 lb.-ft of torque for improved performance. The motor’s total potential is additionally raised by way of a six-speed manual or automatic transmission. Hauling heavier toys is no stress to preparing for your off-road ventures. The V6 provides a Tow Package for total pulling capacity of 6,800 pounds (lbs.) and payload levels as high as 1,440 lbs. You won't have to worry about maintaining steadiness should winds start blowing or cargo movement arises because of instant Trailer-Sway Control. Equipped with Rear-Wheel Drive (RWD), Automatic Limited-Slip Differential (Auto LSD), and Hill Start Assist Control, Tacoma SR5 kicks off your outdoor escapades in the luxury fabric driver’s chair you can adjust four assorted ways. This truck also makes setting out on the highway more pleasurable via standard features, such as remote keyless entry, an automatic sliding rear window, and 6.1-inch (in.) high-resolution display. Fulfill your thirst for adrenaline when you take the wheel of Tacoma TRD Sport and its 278-hp 3.5-L V6 DOHC engine, six-speed manual transmission, and TRD sport-tuned suspension. The exterior appears prepared to combat rough topography with a hood scoop, 17-in. machined alloy wheels, color-keyed tailgate spoiler, and smoked taillights for a bit of striking elegance. On top of the lavish improvements of leather-adorned seats and a power-tilt/slide moonroof, Tacoma Limited excels with power outside mirrors and door handles accented in chrome and a satin chrome grille for dazzling style. Further interior additions you will relish having the chance to leverage consist of dual-zone automated climate control, Qi-enabled wireless mobile device charging, Integrated Navigation, and Entune App Suite. Finding the rush of adrenaline you desire calls for the perfect type of truck in Westbury NY. Tacoma’s bed finish is formulated from Sheet-Molded Composite (SMC) reinforced by fiber for extreme endurance against the thumps, scrapes, and blows of your exciting ventures. Utilize the heavy-duty deck rail setup with C-channel frames and four changeable tie-down cleats to fasten various-size equipment. Even the most difficult of landscapes is a piece of cake for the updated Toyota Tacoma with the introduction of an electronically locking rear differential, Crawl Control (CRAWL), and Multi-Terrain Select. By offering five different settings to select from, altering throttle and brake pressure, and allocating power to the back wheels in equal measures, these offered traction-raising add-ons allow you to travel on a wide assortment of surfaces. When you buy or lease a Tacoma at Westbury Toyota in Westbury, you can gear up this pickup to effortlessly navigate across any terrains you end up encountering. Organized as a control hub for drivers, Tacoma’s interior (accented in soft materials) has the controls situated in an intuitive manner. A touchscreen monitor (high-definition on many variants) utilizes Bluetooth wireless technology for hands-free calling, accessing your apps, streaming audio, and much more. Additionally, the windshield offers up a built-in GoPro stand; all you have to do is affix a compatible camera to document escapades, relive them with your group, and show everyone how to enjoy some intense fun. Wherever your outdoor outings take you, Toyota has built-in layers of safety technology for your brand-new ride. Tacoma serves as the lone truck in its class designed with an included pre-collision indicator. Toyota Safety Sense P (TSS-P) assists in raising your cognizance of roadway activities via active protective systems, and reversing grows simpler and less risky using the tailgate-lever-mounted backup camera. 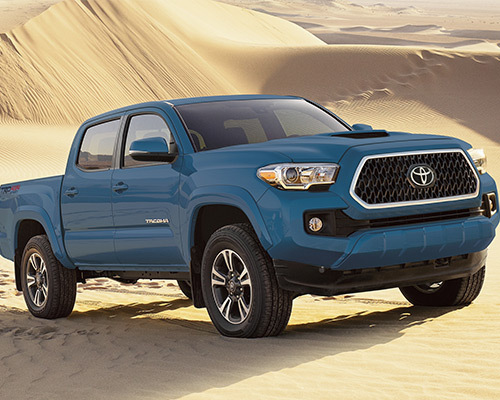 Each Tacoma also features lightweight, high-intensity steel that empowers the framework and optimizes performance. Toyota’s tradition of durability displayed throughout the latest Tacoma permits you to take on all varieties of rough surfaces and form your own course on the trail. Stop by Westbury Toyota right away to buy or lease the latest Tacoma in Westbury NY and obtain a truck that clears the way for more fun with no doubt regarding what it can take on.